Exploring all that Chelsea has to offer just got easier. A new, enhanced collaboration between the Western-Washtenaw Area Value Express (WAVE) and the United Methodist Retirement Communities (UMRC) has led to a free community shuttle transportation service for all Chelsea residents. 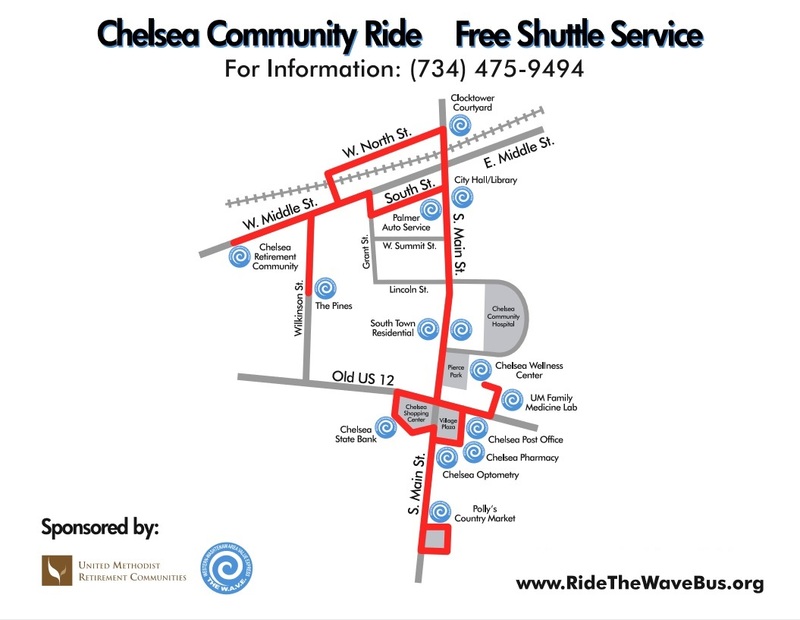 The Chelsea Community Ride now opperates 7 days per week and includes church shuttle services. Click on the links below for scheduled pickup times throughout the community. Chelsea Retirement Community offers multiple living options for seniors, including several independent living choices. WAVE is a nonprofit service organization dedicated to providing community transportation. Passenger carry-ons must be limited to the equivalent of two (2) grocery bags per person or two pieces of luggage. If the vehicle is at capacity, you may be required to carry your items on your lap or at your feet. If a passenger is traveling with a personal-sized cart designed to carry shopping bags, the cart must be secured to the bus with a tie-down strap. Please do not ask drivers to carry or lift heavy or bulky objects or to carry packages on or off vehicles. Exceptions: Seniors or disabled riders may ask for assistance carrying two packages to and from the curb when entering or exiting vehicles. For more information, contact the WAVE Dispatch Office at (734) 475-9494 or visit www.ridethewavebus.org.